It is all rather simple. A sound source such as a microphone, public address system, or television sends sound into an amplifier (the loop box) via an electrical current. Then, the amplifier or loop box sends the current to a copper wire loop that goes around the perimeter of the room, for example. Next, a magnetic field is created inside the looped area. This magnetic field is then picked up by the T-coil in the hearing device (hearing aid or cochlear implant) where the signal is converted into an audio signal that the listener is able to hear clearly and without background noise. Why Is A Hearing Device Better If Used In A Looped Area? Today’s hearing aids are able to provide improved hearing in a variety of settings. However, most hearing aid or cochlear implant users continue to experience difficulty understanding conversation in restaurants, cars, houses of worship and other noisy environments. Another common complaint is experiencing difficulty understanding telephone conversations and the television at home. Hearing devices equipped with a T-coil improve hearing significantly in all looped venues. Television and telephone conversations at home can sound clearer and be heard in both ears simultaneously, when in a looped area and the T-coil is set to the “on” position. A hearing device equipped with a simple T-coil will become your own personal loudspeaker in all looped settings. Do You Have Difficulty Hearing At Home? If you answered “yes” to this question, then there is a simple solution for improving the clarity of television and the telephone. Simply activate the T-coil in your hearing device. 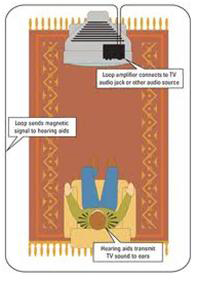 A loop which is connected to your television will send the signal directly to both ears creating speech and music that is discrete and clear. This home loop has a small amplifier box connected to the TV or telephone. A copper wire installed around the room’s perimeter forms a looped area creating a magnetic field. The audio signal is then picked up and sent to the T-coil in your hearing device significantly improving your hearing at home. Hearing loops operate with your hearing device’s T-coil. Therefore, there are no extra devices to wear. Hearing loops work with your hearing devices, hence, you can listen to television and others in the same room at the same time. The television volume can be controlled by others in the room as desired while your television volume is controlled by the loop system. Any number of people can use the loop system at the same time because the signal from the loop is picked up by the T-coil in the hearing device and is not dependent on specific frequencies. You will receive optimal sound quality since your hearing device’s T-coil program will be programmed to accommodate your individual hearing loss. Contact to schedule a free demonstration of a home hearing loop and to determine if your hearing device is equipped with a T-coil. You will be amazed at how well you will hear once you get in the loop! Remember, better hearing is only a T-coil away. We have trained hearing loop professionals who can assist you with the installation of your home loop or can install the system for you at a reasonable fee.